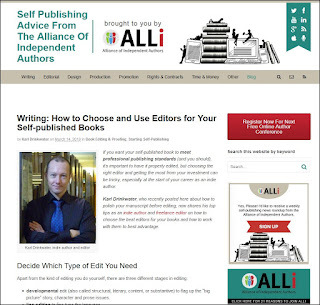 Over on the ALLi website you'll find an article where I give various tips on how to choose and work with editors. Here's a backup of the article. These tips can save time and money when working with an editor. It follows on from my article about Ways To Polish Your Manuscript. Make your work as good as possible before sending it to an editor. These self-editing tips will help with that. The editor can then focus on bigger issues. Or, if they are paid by the hour, you’ll save money because they won’t waste time fixing all the small errors you could have spotted. I’ve edited books for others that are a joy because they are so well-polished that I can focus on more complex issues of style and structure and character. If you use a particular style guide then let the editor know. Likewise if you have a house style covering things like which numbers will be written as words, serial comma use, -ise versus -ize etc., then pass that on too. If you don’t have a fixed style that’s fine, those things will come up in queries: but having one can save a bit of time (and money). I’d recommend that anything of this type that is raised by your editor should form the basis of your style guide for the future, or add to your existing one. After working with a few people you’ll have a comprehensive list of your editorial preferences, and it will soon become a subconscious part of your writing, aiding consistency. Most editors will edit a sample of your work for free, usually a few pages, and provide a quote based on that. Make use of the service. If (after due consideration) you don’t agree with their suggested changes, or you don’t feel like you’d enjoy working with them, then go elsewhere. It helps if author and editor think along the same lines. And if the editor made suggestions where you can see that your work would be improved by them, then you’ll be off to a great start. If you suspect your work has problems of style and repeated errors, then you could save a lot of money by getting an editor to just edit a few chapters. Then whatever common things they pick up on (mistakes of style, grammar, sentence structures, overuse of passive voice, speech tags, punctuation etc. ), you can go through rest of book yourself fixing those. Then you’ll really understand that issue, and be less likely to make the mistake in the future. Also any future editorial work won’t require the same little things being pointed out again and again. Likewise you could get an editor to look at just the areas you feel are weaker, such as the opening of your novel. I did this once with a short story collection where I knew most stories were good since they’d been polished in the past; some had even been published already and just needed a few tweaks. However, other stories were brand new, more experimental, and I was less sure about their strengths. In that case I just paid a substantive editor to work on the new stories. There are different kinds of editorial process. The first edit (called the developmental, structural, literary, content, or substantive) will flag up the “big picture” story, character and prose issues. Much of their work will be suggestions. They can’t rewrite your book and make the decisions for you, but they will suggest what it is needed, and give pointers on how to do it – whether it is throwing out unneeded characters, adding in a subplot, working on style, or coming up with a different opening or ending. You read the suggestions, decide which way to go, rewrite as necessary. Yes, the author does the bulk of the work, because it’s your book. Common advice is that it’s generally better to have two different editors than have one act as both literary editor and proofreader. The benefits go beyond fresh pairs of eyes, or the fact that one person will never find all the typos and errors in a book. The description of a developmental edit above shows why one editor can’t do everything – it is not a “final” edit, because you’ll make changes after that, which may well introduce new errors and create a new version of the document. Likewise there’s not much point the editor spending too much time correcting typos in sections that they are recommending for deletion and rewriting. The assumption is that after the first editor you will do more work. Sometimes a lot more. When the book is deemed “finished” it needs at least one final pass for error-catching, ideally by a person who hasn’t read it before. This may be referred to as a copyedit or proofread (there is a difference between these, but both are final-stage types of edit). This is generally cheaper and quicker, and less work for you after it - ideally just making changes to errors and typos. I use this two-step process. After I’ve done my first draft, as polished as possible after various re-reads, software tools and so on, I send it to my literary/substantive editor. They focus on the big issues like character, plot, style and so on. After more rewriting, restructuring, edits and fact-checking, and only when I’m satisfied that it’s the best it can be, it goes on to my proofreader for the final polish. As well as finding the right type of editor, there are some other considerations. Genre. Some editors specialise in particular genres or styles. They are more likely to know the tropes and expectations of the genre than one who is a stranger to it. Likewise they all have their own specialisms in terms of writing – one may be great at dialogue, another at structure, another at developing mood. This is where an editor who is also an author can be a big help. Nationality/region. If your editor is in a different country (e.g. UK/US) then make sure they are familiar with your country’s spellings and idioms. If the book’s content is heavily tied to a region or subculture where there are all sorts of nuances of language or dialect then it might be advantageous if the editor is familiar with that area. There are benefits to sticking with the same editor over time. They get to know you and your style, the rapport is strengthened, and the writing can be taken to the next level. Sometimes it also becomes cheaper because they know your work won’t contain basic errors any more. There are also benefits to working with different editors, since you learn different things from each of them, like having different teachers. I adopt a mixed approach: I have my favourite editors, but when they are busy I never mind trying out a new editor. When you work with an editor you are not just working on that single book. You are learning things that you will take forward and apply to future works. I always learn a huge amount from my editors, and I have worked with a lot of them over the last ten years. Editing costs can go down over time as you become a better writer. Early in your career money spent on editing is as an investment in your writing future. When I left paid employment to become a full-time writer I invested most of my savings in my business, from buying ISBNs and software to going on writing courses and setting aside the money for editing and proofreading costs for a number of books. Related to this growth in skill, there is nothing to stop you going back to previous books and revamping them after you have a few more titles under your belt. I’ve done that with my early works, applying new skills, choosing new covers, reformatting interiors, and writing new blurbs. A lot of the rewriting was easy because I had learnt more in the interim, having worked with other editors.